At Toyota of Tampa Bay, we pride ourselves on making sure you have a fast, friendly, fair and fun experience every time you work with us. That’s why we’re offering our special Platinum Loyalty Program to our loyal customers. We want to make sure you’re getting the best deal possible and we’ll always work hard to get you the lowest interest rate possible. If you’ve made the last 12 consecutive payments on time, you qualify for a lower interest rate. If you have a rate of 10% or higher, you may qualify for a rate as low as 0%. There’s no down payment required to lower your rate! Visit Toyota of Tampa Bay to find out if you qualify. Then, you’ll drive home in a brand new Toyota for close to what you are paying today! 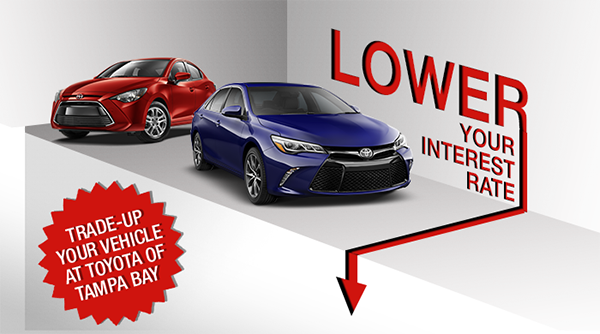 Discover the Difference at Toyota of Tampa Bay! Your best buying experience starts now with the Platinum Loyalty Program. Simply fill out the form to get started, then get to Toyota of Tampa Bay in Florida, proudly serving Tampa, Wesley Chapel, Brandon and surrounding areas. 0% APR available on select 2016 and 2017 Toyota models. Not all will qualify. $995 dealer fee not included. See dealer for complete details.